Officials of the National Drug Law Enforcement Agency (NDLEA) arrested 47 year-old Odili James Onyekwere at the Murtala Mohammed International Airport (MMIA) Lagos for trafficking 270g of banned substance which tested positive for cocaine. 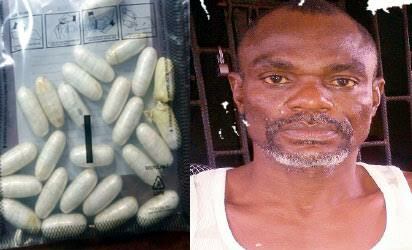 Odili upon his arrest excreted 25 wraps of the cocaine substance. “I am married with two children and I sell shoes in Lome, Togo. As a result of the economic downturn my capital kept depreciating until I lost everything. This is my first time of smuggling drugs. It was the frustration of not being able to provide for my wife and two children that made me to smuggle cocaine. They promised to pay me a thousand dollars”.